Patrons enjoyed a class on India Pale Ales at the Greenville Public Library Thursday night. DARKE COUNTY — Patrons enjoyed a class on India Pale Ales at the Greenville Public Library Thursday night. Local resident David Nilsen taught the class, part of a series of lectures on craft beer-related topics he delivers at the library each month. IPAs are the most popular American style of craft beer, serving as a showcase for the fruity flavor and aroma of American hops. In addition to his work as a freelance beer, food and travel writer, Nilsen teaches classes in a variety of venues, including local libraries and restaurants such as The Merchant House, as well as bars and breweries throughout the greater Dayton area and beyond. 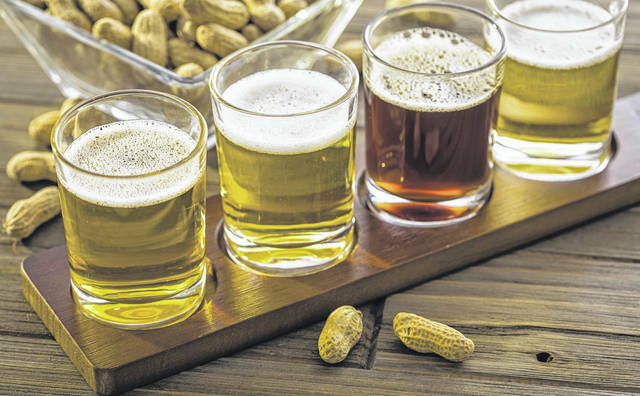 Classes at the Greenville Library cover a new topic every other month: August and September’s class will focus on American originals, beers developed in the United States rather than being based on European styles. “Well, you’ve got to drink a lot of beer,” Nilsen said when asked about the process of becoming a certified Cicerone, a professional trained in all aspects of beer service and food pairing. Nilsen traveled to Chicago to take an exam, earning his certification in February of 2017. Offering classes in small-town areas like Greenville is an especially rewarding experience, according to Nilsen. Smaller populations can sometimes make learning about diverse topics more challenging in rural areas, Nilsen said, but offering classes in Darke County allows him to bring his knowledge of beer to an enthusiastic audience that might not normally be exposed to it. Ultimately, Nilsen said, he wants to help enrich the beer scene in Darke County. “Places like The Merchant House have raised expectations on the food scene, and I’m trying to do that for the beer scene,” Nilsen said. More information IPAs and related topics can be found at davidnilsenbeer.com. This entry was tagged Beer, Greenville Public Library, library. Bookmark the permalink.